We specialize in document scanning, OCR, forms processing and document management software that is inexpensive, easy to use and scalable for small businesses and departmental solutions. IRISDocument 9 Server is the most robust solution to structure, index, highly compress and convert your documents into optimized searchable text files. IRISDocument 9 Server is designed to process large volumes of documents either on a single workstation or on a server using images coming from multiple workstations. The professional solution to structure, index, highly-compress and convert your documents into optimized searchable text files. IRISDocument 9 server is designed to work as a stand alone software. With the Watched Folder mode, all your documents will be automatically processed and converted 24/7 with very few user intervention. You do not need a specific scanning solution to run IRISDocument 9 Server. The iHQC, Intelligent High Quality Compression, is the new hyper compression technology from I.R.I.S. It will dramatically reduce the size of your color PDF files without compromising the quality of the images and the legibility of your document. You will get a better quality than in JPEG2000 with a PDF size much lighter. The OCR accuracy report provides a graphical view of the OCR accuracy results on all kind of documents. It helps the final user to tune his scanning software to obtain an optimal OCR result. With this new feature, you can evaluate the quality of the OCR process done on your documents and adapt the settings of IRISDocument as well as the settings of your scanners to get the best results possible. - PDF/A: Stricter than a regular PDF, this is the ideal PDF format for long-term archiving. - PDF Security Method: Create protected PDF files that require a password to be displayed, to be modified, to be printed, etc. - OpenDocument Text (*.odt): OpenDocument Text is a fully-documented open format based on XML. It can be read into OpenOffice and StarOffice. IRISDocument Server is designed for non-stop 24 hours processing of documents and can receive documents from multiple origins simultaneously in more than 120 different languages. - Based on I.R.I.S. 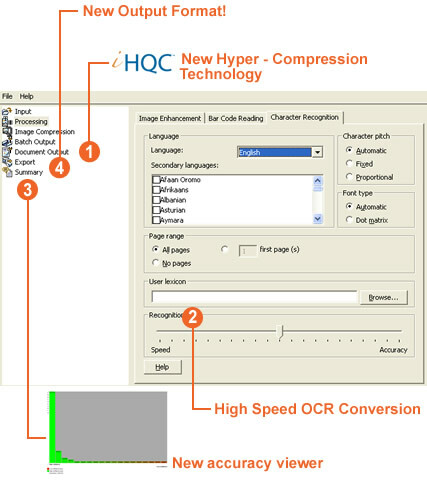 's sophisticated and multilingual production OCR technology, which is up to 4 times faster than most OCR engines. - Separately for each language, a unique dictionary and character set is being used.